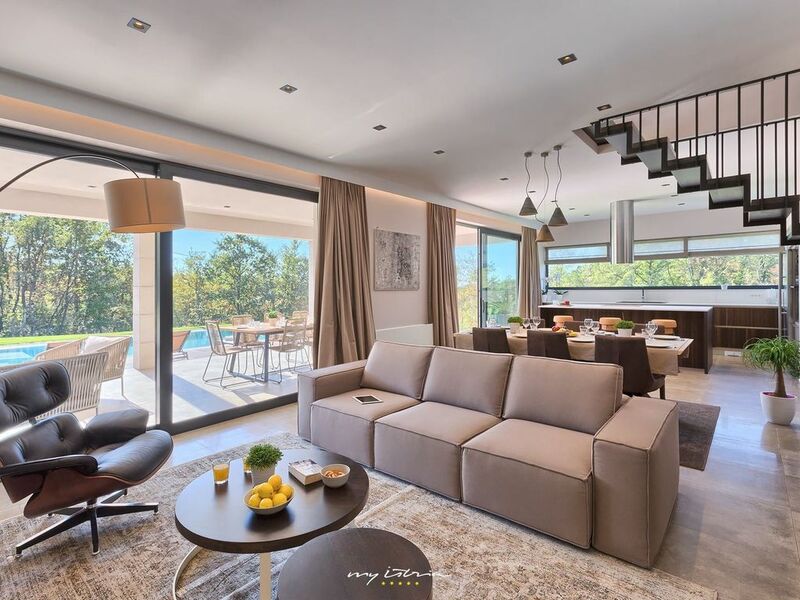 Set within a spacious lawned garden and incredibly relaxing natural surroundings, Villa Gianno is an impressive, contemporary property designed to provide comfort, privacy and a truly unwinding holiday experience. Flooded with light and incredibly stylish, the spacious open plan living area is the ideal place to relax out of the sun, with an elegant dining area and immaculately designed modern kitchen complete with a breakfast table. Floor-to-ceiling patio doors open out from here onto a covered poolside patio so you can head outside to enjoy your meals in the mild Istrian air. The four comfortable bedrooms are all fitted with a high-end ensuite bathroom, as well as a flat screen TV. Two of them are on the ground floor, while the other two open directly on the beautiful first floor terrace overlooking the stunning surroundings. If you still have energy left after a swim in the tempting private pool, there's also tennis table, bicycles, badminton and mini football courts, as well as a children playground, while the indulgent wellness room adds an extra touch of luxury. A stones’ throw from the golden beaches and charming seaside resorts along this stretch of coast, this unique modern villa will astound you from the moment you arrive. Wenn man sich die Homepage anschaut verliebt man sich in die Bilder. Wenn man dann dort war hat man sich in die Villa verliebt! Neben dem unglaublichen Grundstück, war auch die Gastfreundschaft super! Wir kommen jederzeit gerne wieder! Wir waren für 2 Wochen in der Villa Gianno und haben uns von der ersten Sekunde an wie daheim gefühlt. Das Haus ist genau so wie auf den Bildern. Durch die Alleinlage konnten die Kinder toben ohne andere zu belästigen. Man hört nur das Blöcken der Schafe, Hundegebell und entferntes Krähen von Hähnen. Kristina war von der Ankunft bis zur Abreise für uns da. Sogar mit Früchte und Tomaten und Kürbis von dem Familiengrundstück wurden wir von Kristina und ihrer Schwiegermutter versorgt. Wir kommen wieder! Just wanted to send you a quick email to say how much we enjoyed staying in Villa Gianno, it was a bit like coming home. Without doubt one of the favorite houses I stayed during my time in Croatia! Upon arrival we were warmly welcomed. New property and kept extremely clean.The pool was really as big as it appeared in the photographs, the beds were comfortable, love the new kitchen and the bathroom set up- feels so spacious and of course the sauna & Jacuzzi! Thank you so much for allowing us to stay here. We loved everything about it and did not have a single complaint! We would recommend this location to everyone we hear that have an interest in staying in Croatia. Your suggestions on everything to do were spot on and helped us tremendously! Wir waren als zwei Pärchen mit je einem Kind für eine Woche in der Villa Gianno. Gegen Ende bereuten wir, dass wir nicht gleich zwei Wochen in dieser traumhaften Villa verbracht haben... Toller Zustand, geschmackvoll eingerichtet, alles genauso wie auf den Bildern. Wir können jedem der etwas Ruhiges sucht dieses Haus nur wärmstens empfehlen! Vielen Dank an Kristina! Wir waren als 8-köpfige Jugendgruppe im Alter zwischen 22 und 24 Jahren in der Villa Gianno und waren ausnahmslos begeistert von der Villa! Die Villa bzw. das Grundstück bietet alles um eine tolle Zeit zu verbringen. Die Villa ist außerdem ruhig gelegen und in TOP Zustand. This stunning villa is located in a peaceful countryside setting just on the outskirts of the historic hilltop town of Visnjan. The winding alleys of this enchanting little town witness the rich historical heritage of this place, while at the same time offering a spectacular sea view. It is well renowned for its famous observatory but also for its exceptional traditional gastronomy which can be savoured in the many restaurants, agrotourisms and local cellars in the area. For more buzz, the ancient Roman town of Porec is at a mere 20 km from the villa, offering an array of heavenly beaches, a well-developed tourist infrastructure, excellent restaurants and cafes and some great nightlife along with UNESCO listed monuments and culture.